They are callous to the core and find their callousness amusing (which of course it actually is for the viewer.) In one scenario property tax people from the local government come to collect taxes and Juliana tries to throw them of her track by directing them to the house of a woman she doesn’t like, so that she can feel their wrath instead of her. In another situation there is a man in the village who has recently had a stroke. He drops dead after being thrown out by the landlord over a pot of jollof rice that he refused to give the landlord as it was the only food his family had to eat. On his death the landlord goes to the family and refuses to let them bury him until they pay of his “debts” which are of course imaginary. After all the misery that they have caused the film fast forwards 8 YEARS ahead to show us their current day situation. Uche the landlord’s son is even more arrogant, unbearable and reckless than his parents were. He boasts to his friends about being the landlord’s son as if that makes him royalty and spends money like water. This scene is very comical in that you would expect her to be upset that she has no place to live and that her son is a thief, but instead she is more concerned with the fact that her husband did not die soon enough for her to be awarded the title of landlady. “It is good to have a giving heart,” and cancels the debt as well as giving them 5000 Naira. CHANCE WOULD BE A FINE THING!!! It turns out that this scene is a dream; perhaps this dream is symbolic, representing and ideal world where in reality this would be the case. Alas! It is not. The reality is not even bad, it is worse than worst! 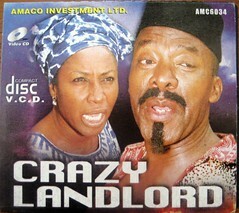 The new landlord turns out to be the son of the man who died of a stroke after a battle over a pot of jollof rice. EIWWWWWWWWWWOOOOOOOOO! Revenge is sweet! As can be expected, he reveals himself and has NO sympathy. On realising what could be their possible fate they both faint. It is up to the viewer to decide what their fate could possibly be. I’d definitely recommend this film. It is concise and in one part, which is definitely a plus when nowadays you have films dragging on into a million parts. There are no long draggy scenes that characterise many Nollywood movies. The lesson to be learnt is that situations are changeable, what lays in ones past may not necessarily dictate their future and that one should treat others as they would in turn expect to be treated because if you don’t karma is a BIZATCH!! !